Is it fate or chance that haunts the Children of Men? Home » audio reviews • cinema reviews • drama • sci-fi • thriller » Is it fate or chance that haunts the Children of Men? Alfonso Cuarón’s film adaptation of the P.D. 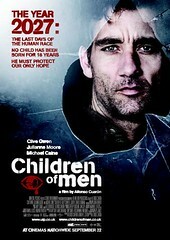 James’ book Children of Men is an incredible work of art marked by some of the most amazing cinematography I have seen. Opening on Christmas day in 2006, critics compared the characters of Theo and Kee with Joseph and Mary, calling the film a “modern day nativity story”. Children of Men envisages a world one generation from now that has fallen into chaos on the heels of an infertility defect in the population. The world’s youngest citizen has just died at 18, and humankind is facing the likelihood of its own extinction. Set against a backdrop of London torn apart by violence and warring nationalistic sects, the film follows an unlikely champion of Earth’s survival: Theo, a disillusioned ex-activist turned bureaucrat, who is forced to face his own demons and protect the planet’s last remaining hope. Author James refers to her story as a “Christian fable” while Cuarón describes it as “almost like a look at Christianity”: “I didn’t want to shy away from the spiritual archetypes,” Cuarón told Filmmaker Magazine. What they’ve produced is a dark, dystopian fable grasping for hope and miracles amidst a bleak future landscape. It was one of my favorite films of 2006 and a privilege to examine and speak about in a Cinemagogue presentation at Mars Hill Church. The audio presentation is available here. Is the Prince REALLY on the Throne? My favorite movie of the decade! I just stumbled across cinemagogue via the mars hill church site. Great project. It is so important to look at the world we inhabit and not be afraid to do so. Very good analysis of Children of Men. I look forward to following this blog/site more. I wrote a piece about Children of Men a year ago here. a shame it didn’t win cinematography. Hi. I loved this film and was looking forward to hearing your take on it. Unfortunately, the MP3 file seems to have disappeared and won’t download! I believe it is fixed – try it now!